[For until John and Peter saw the empty tomb,] they still hadn't understood the Scriptures that said Jesus must rise from the dead. Then they went home. John and Peter have made the most amazing discovery in the history of the universe, and what did they do? They went home! They went home? Why didn't they go out into the streets of Jerusalem and shout the news? Why didn't they tell everyone within earshot that Jesus was alive again? 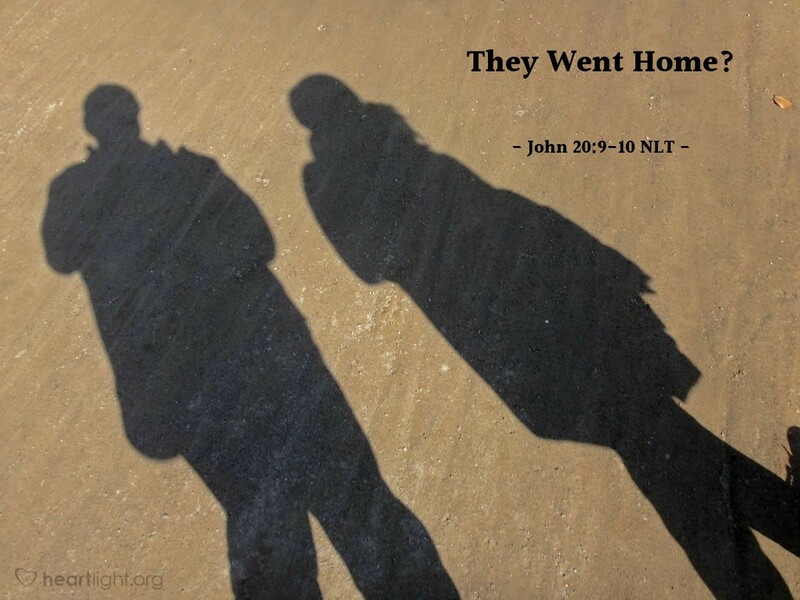 I'm not sure, but there is something powerful and centering about what they did: "they went home." Our faith must be lived and shared at home. We must try to make sure it works there, is demonstrated there, and is shared there. Faith must work with the people who know us, know our hearts, and know our disappointments. The Gospel always starts where we are and radiates out. So they went home. Maybe it's time we put more effort into taking our knowledge of the resurrected Lord home, first! Lord God Almighty, please help my influence and my character at home to be a blessing to my family. Help them see the power of the resurrected Lord in what I do, what I say, and how I treat them. Give me the influence and the integrity to inspire faith among those I love. In Jesus' name, I pray. Amen.